The number of self-employed people in the U.S. increases every year, a result of the growing “gig” economy which gives workers more independence and autonomy than ever before. A lot of those freelancers are working in their own homes, transforming attics, garages, nooks, and crannies into functional, if not always comfortable, workplaces. In fact, buoyed by demand, home offices have become one of the hottest residential amenities. Check out these three home office trends. Don’t have a dedicated space available in your house for a comfortably-sized office? Not yet ready to clean out the garage or convert that adult child’s old bedroom? Consider “shed” quarters, a small shed dedicated to a home office set in a corner of your backyard or on your driveway. Particularly popular in four-season areas like California, where heating and cooling aren’t always necessary, these pre-built or built-to-order sheds often have multiple windows, flooding the room with natural light. They can be ordered with or without insulation, depending on the situation. The outside office allows for a quick commute across the lawn and an instant return to the homestead if you’re needed. Those who are self-employed often work longer hours than their counterparts in large companies, mostly because they’re working for themselves. Long hours can mean discomfort if you’re sitting in a hard-backed wooden chair moving around a mouse that’s resting on a desk a little too high for your arm. In an ideal world, you’d be using furniture and equipment specially designed to reduce fatigue and discomfort. That’s the heart of ergonomic design. Perhaps you’d like a computer desk that can be transformed instantly to a stand-up desk to allow for a healthy switch in position in the middle of the day. Perhaps you’d like a chair that supports the small of your back and promotes proper posture. Perhaps you need a computer mouse that fits to your hand. Many small changes can add up to a lot of comfort. Because home offices are becoming as important to designers and architects as kitchens, bathrooms, and dining rooms, entire industries have sprung up to offer new and exciting furniture options. Modular furniture that allows for easy rearrangement might be perfect for the self-employed person who thrives on switching things up. 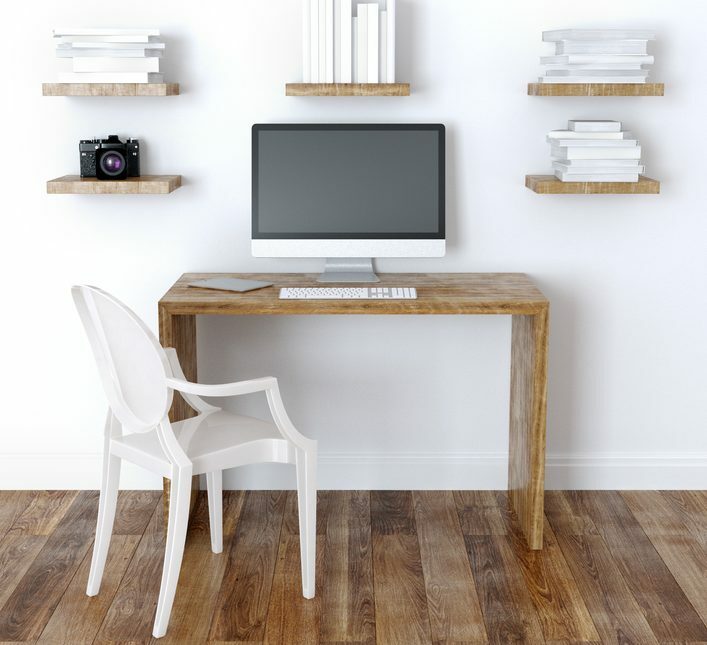 Custom-made wall shelving and desks can conform to the freelancer’s particular needs, not some generic desk-and-chair-and-file-cabinet formula. And for those who want their home office not to look like an office at all, many designers now integrate statement pieces, such as vintage furniture, striking artwork, collection displays, etc. Nobody wants their home office to look like a cubicle in someone else’s company. If you’re looking to convert a room or freshen up an old space, talk to a designer about how you can make your home office reflect you.